Our Spring Break is now over…I’m sending the kids off to school as we speak I type. All in all it was a wonderful week with kids home, being with both families, Holy Week services, multiple egg hunts and painting the hallway. Ever the optimist, I began what I thought would be a fairly simple project: to paint our hallway downstairs and if all went well, to continue it up the staircase and down the upstairs hallway. My eldest wanted to help, so I thought…piece of cake! We bought the thickest paint from Lowes, what they say is their primer/paint combination that allows for a one-coat application. Cosmic Cream sounded and looked like just what I wanted. I knew, from having painted other rooms in our home, that it would probably need two coats. As the week wore on, and my helper wasn’t able to help with the second coat, it became evident that a probable third coat would be needed. And that’s where it sits… I’m not a fan of unfinished projects. So. I’m thinking today is the day to put on the final coat of paint. That is, if LIFE will allow. But getting back into my weekly work/family routine doesn’t allow for lengthy spans of time. We shall see. I sat down at the kitchen-end of the hall to draw the above and then painted “the walls” with the Valspar Cosmic Cream paint. My sketch just might be more finished than the walls will be. Oi! P.S. This is the stuff of the FEAST…ordinary, slightly boring, not-yet-finished LIFE. I hope you have a FEAST-FUL week! And a chance or two to draw it! I am quite slowly getting nothing at all done…. . . . . .
What I love about this drawing is the floor filled with words. Yes, I wish painting a house went the same as painting it on paper too 🙂 . Hope your work is soon done and you’ll be able to enjoy the results. Wow. I would never have any idea where to start which those floors and tiles, probably because I’ve been renting places ever since I moved out of my parents’ house in my teens. Love the drawing as always, great post! I am surprised it needs a third coat. That happens with my Walmart cheapo paint but didn’t think the more expensive paints would perform so badly. My daughter swears by Behr but I used a red paint by them and needed four coats (I was painting chairs at the time). I figured it must have been due to being red and therefore not getting the titanium to make it opaque. 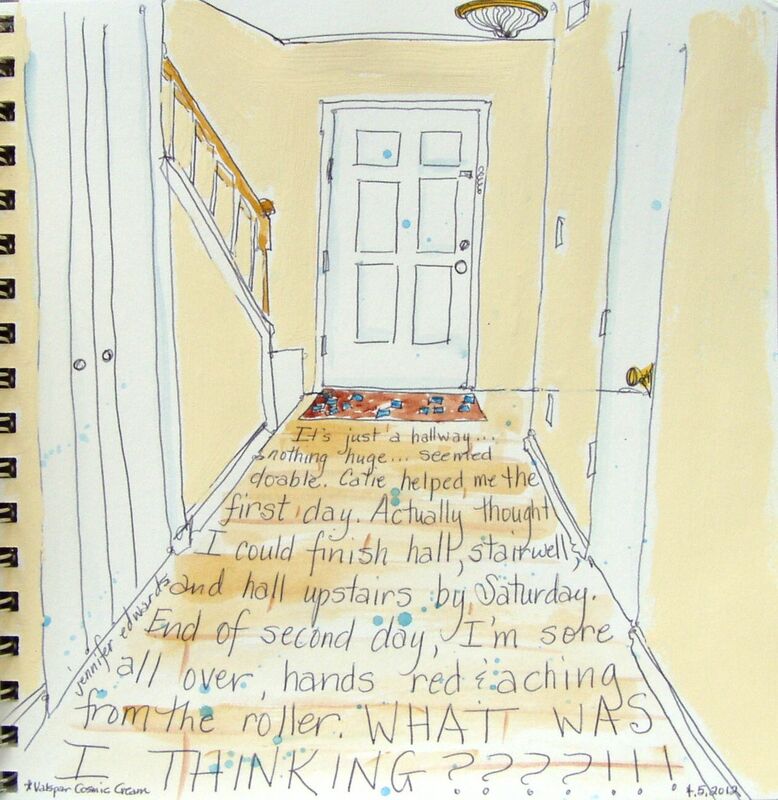 Although I enjoy painting in my journal, painting the house is not fun! Did you tape everything off or just wing it with the brush at all those edges? You don’t have to keep rinsing the roller if you wrap it and the paint tray in plastic between sessions. It will be pretty when done. Keep thinking of that. Love ow you wrote on the floor in your journal. Hey Timaree…the cream is trying to cover a kind of greenish gray, so I think that’s why it needs the extra coat. We taped off certain edges, but left the baseboards to just wing it and hope for the best. Got a final coat on yesterday and it looks great! Now for the staircase and upstairs hall…whew! Love your sketch! Sorry the painting project isn’t going as planned. Hopefully you will be able to finish it soon so you can enjoy the beautiful result of all your hard work! Oh, I feel your aches! Love the sketch! Isn’t it amazing how this sort of job seems never-ending… Still, think how pleased you will be when it is done! I’ve done so much painting in the house over the last few years…I’ve come to expect that nothing will go as planned! On the bright side, I never tape anything anymore as I’ve become quite skilled at making straight lines! Love this page, the way you wrote on the floor and the way you used the actual paint to paint the walls!